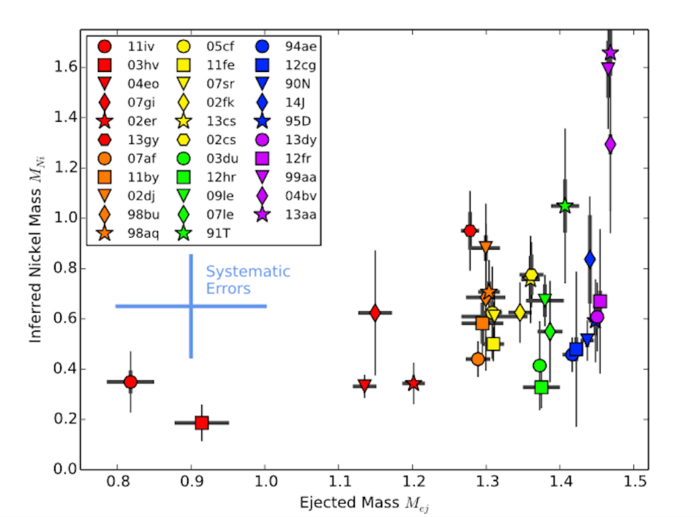 Mike Childress has submitted a paper analysing 94 nebular spectra of type Ia supernovae in the most extensive study to date of cobalt emission lines. Type Ia supernovae are powered by the radioactive decay of 56-Ni to 56-Co during their early phases. After about 60 days the decay of 56-Co to stable 56-Fe powers their luminosity. Mike’s paper shows that the initial mass of 56-Ni can be determined from the flux in the cobalt 5892 Angstrom line (a forbidden transition of Co III). This is powerful diagnostic as the amount of 56-Ni is a direct probe of the explosion. The extensive analysis shows that type Ia SNe appear to be clustered in two groups; one with narrow lightcurves, low stretch and 56-Ni masses around 0.4 solar masses; and a second group with broader lightcurves that span 56-Ni mass range of 0.6 - 1.2 solar masses. This suggests two distinct SN Ia explosion mechanisms.